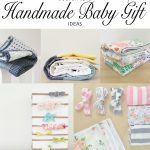 I’m so excited to share this tutorial with you – it was really fun to put together and I think the result is a gift set that any Mommy would love to receive but more importantly actually get so much use from during their baby’s precious newborn stage! 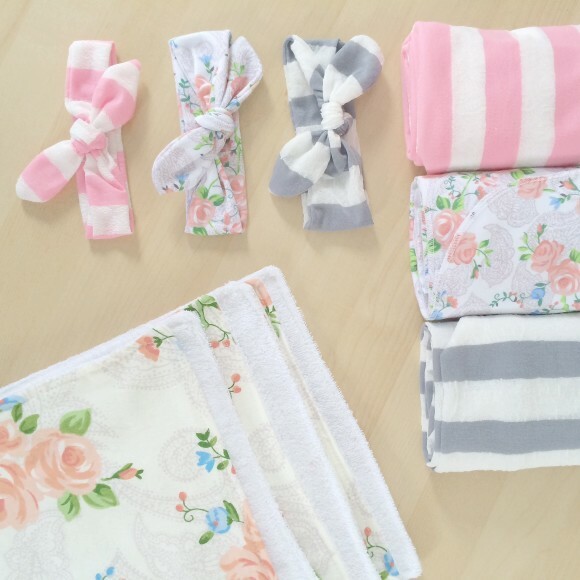 Of course the headbands in this set are well suited for an infant girl, but you could sub them out for bibs, bow ties, or knotted hats for baby boys. I’ll run down the instructions for each item separately. 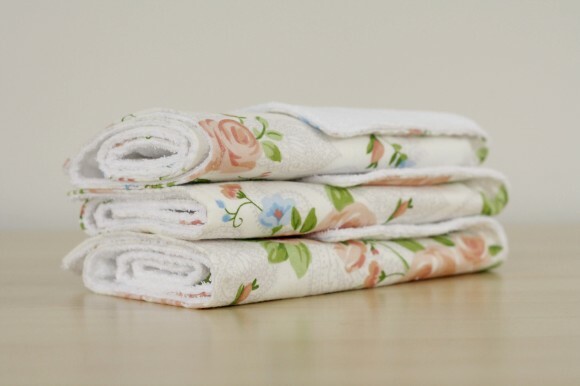 The set includes 3 giant jersey knit swaddles (multipurpose, can also be used as nursing covers infinity scarves, carseat covers and a great summer blankie! 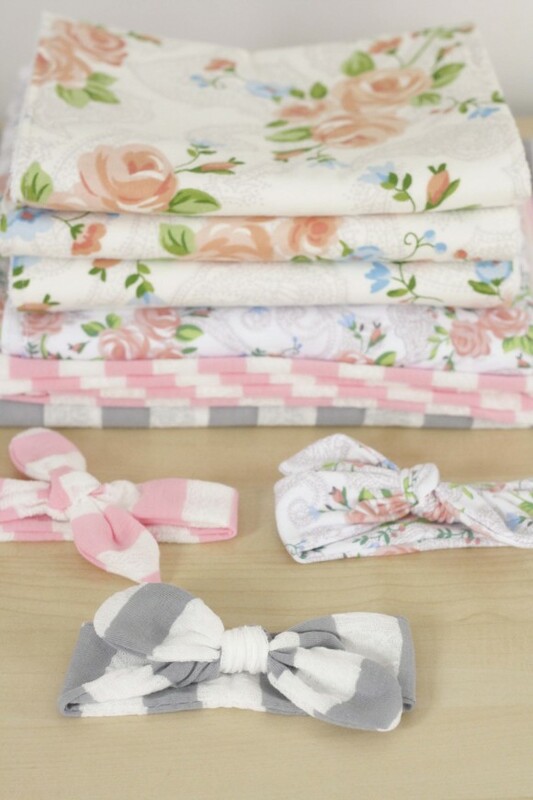 ), 3 soft and absorbent flannel and terry burp cloths, and three matching newborn knot headbands. 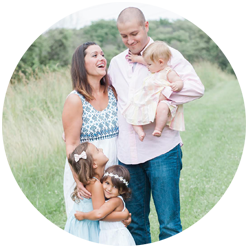 The headbands are designed to be tied to fit baby’s head so they can easily grow with baby as they get older. 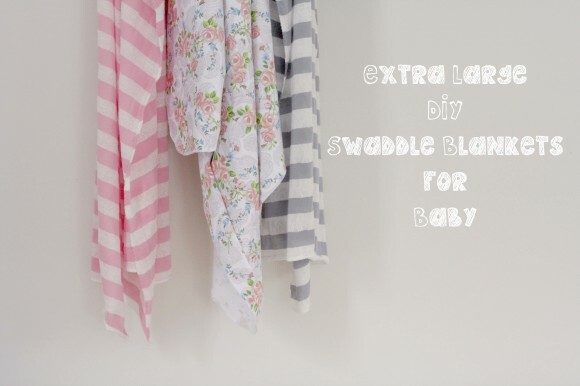 I love that they match the swaddles and can be worn to coordinate! I found all of these fabrics at JoAnn’s. This is a good place to look for coordinating fabrics because they order their bolts from designers that create lines exclusively for them- often making cotton/jersey/and flannel versions of the same or similar print. If you can’t find matching prints look for stripes and solids that coordinate or use solids with a print of the same color. Just have fun with it! 1.5 yards of 3 different jersey knit materials (they will be fairly thin, soft and stretchy). 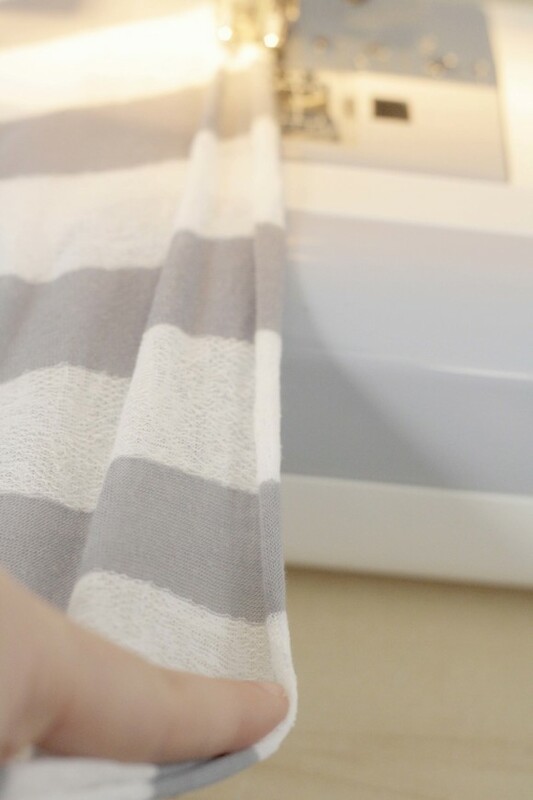 Lay one piece of jersey knit flat on the floor and smooth out the wrinkles as best you can. 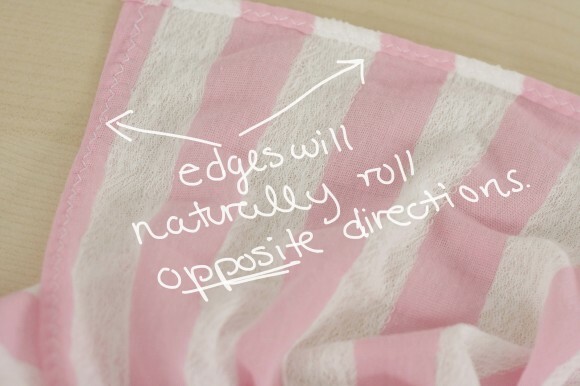 Fold one corner of the material down to the opposite edge to create an even triangle. This is going to help you trim up an even square. Cut off the excess material so fabric triangle opens to make a square. (Dimensions will be roughly “x”). 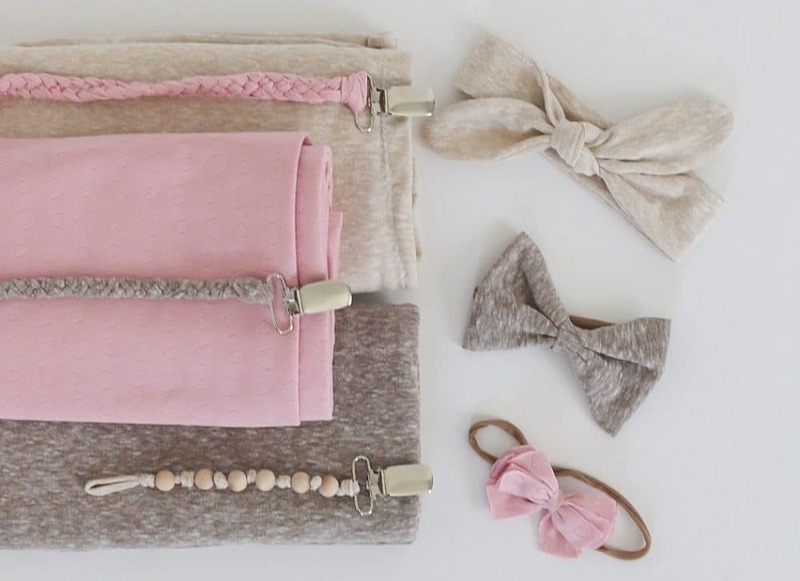 Set excess aside for headbands. I rounded the corners of ^ this blanket just for an added cute touch. Fold the blanket in half and in half again so all the corners match up. 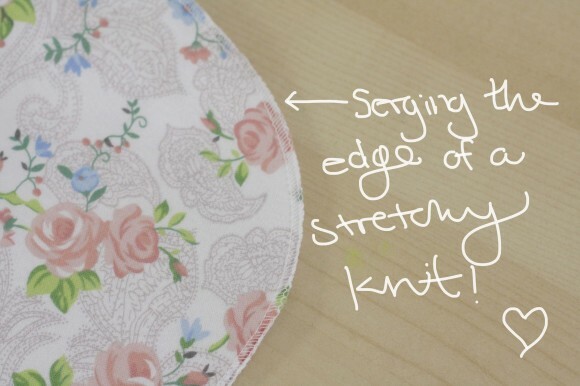 Trace a round object right up against the corner with a fabric pen or pencil, then cut using a rotary cutter. Easy peasy, right?! 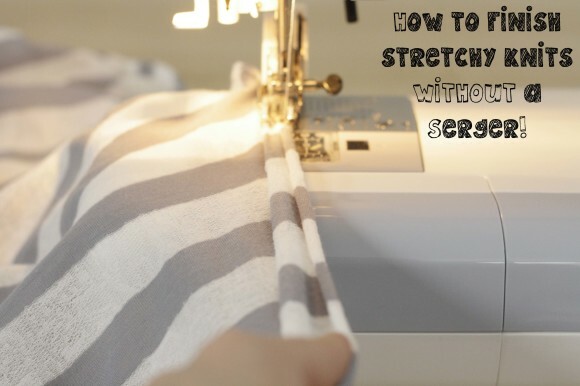 If you don’t have a serger…no worries! Pull gently on the edge of your material. This will cause the material to stretch and “curl” evenly along each edge. Feed this through your presser foot and use a wide zig zag stitch to sew the curl down. Don’t try to force the edges to “curl” or roll in the same direction (they won’t). That’s all there is to is! Just finish each edge like this and the blankets are ready to go. 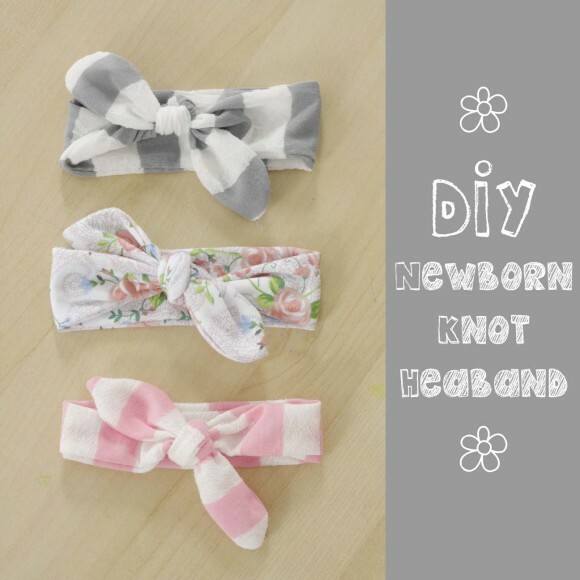 Next up are the adorable newborn knot headbands. 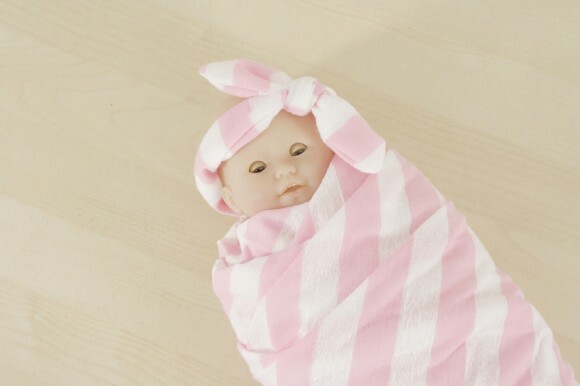 These are so popular lately and I love how they look on a sweet little newborn- just too cute for words. 1. 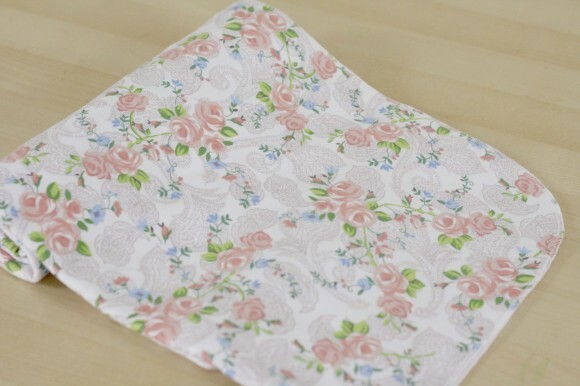 Lay your extra jersey knit material on a cutting mat and fold it in half. 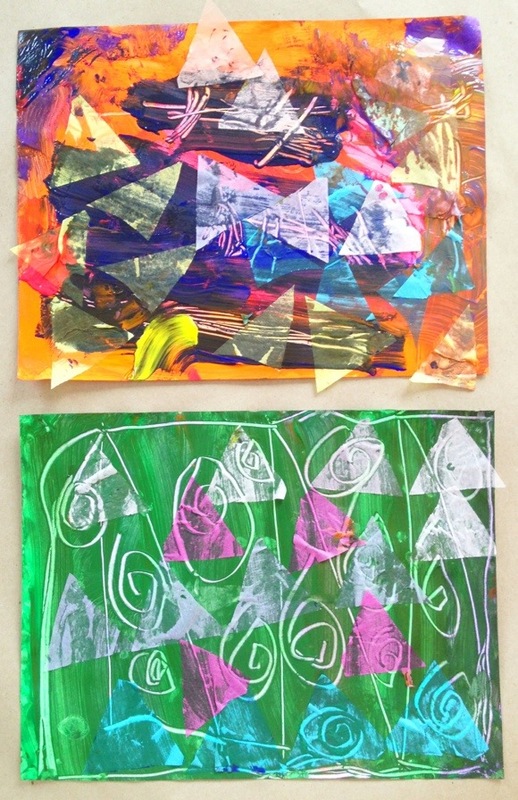 Using a two inch ruler, cut out a 2″ x 22″ rectangle. Move excess material aside and trim edges into a point. 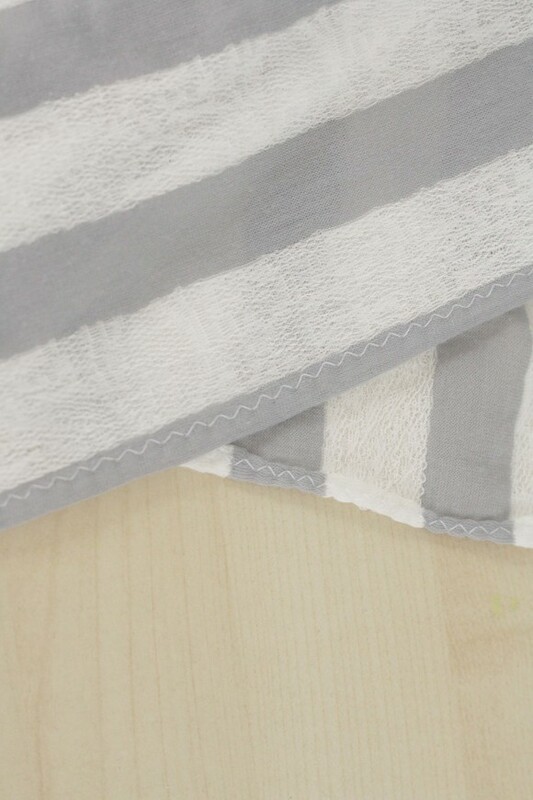 Being careful not to pull or tug on the material AT ALL (it will curl annoyingly) use a wide zig zag stitch to sew the edge (with a two inch gap left open in the middle of one side to turn). 2. To easily turn this piece follow diagram above: stick your thumb into the opening and gather all the material down onto your thumb. Use your index finger to pinch the tip against your thumb. Push your index finger down and work the tip of the headband through the opening. Pull on the point and the whole side will easily turn right side out. Repeat with the other side. 3. 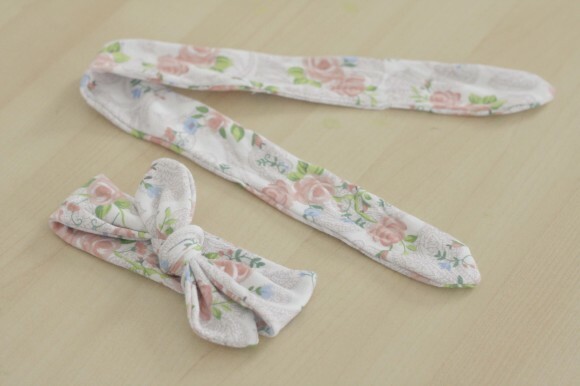 Use an iron to gently flatten the headband piece, ironing opening seam folded inward to match rest of headband. Use a straight stitch to close the gap. 4. Tie a cute top knot and they are done! 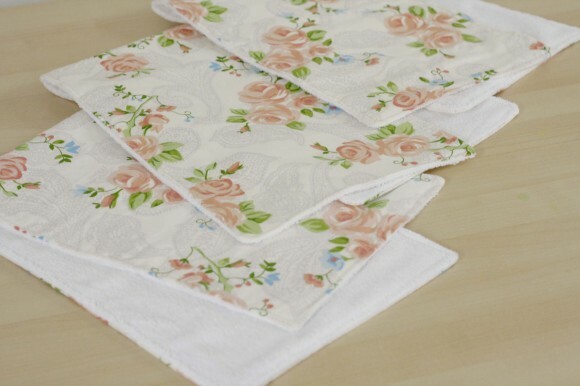 Last but not least, the burp cloths! 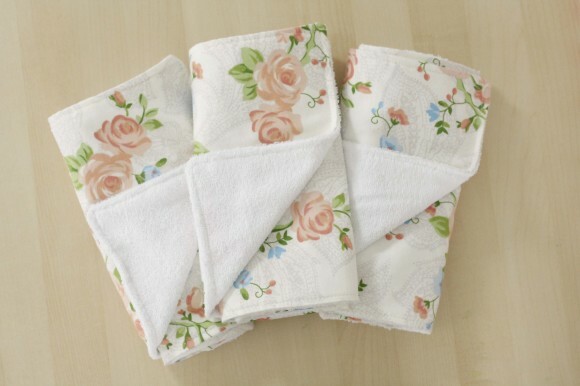 For these, you need about one yard of flannel and one yard of terry (or any towel material). 1. 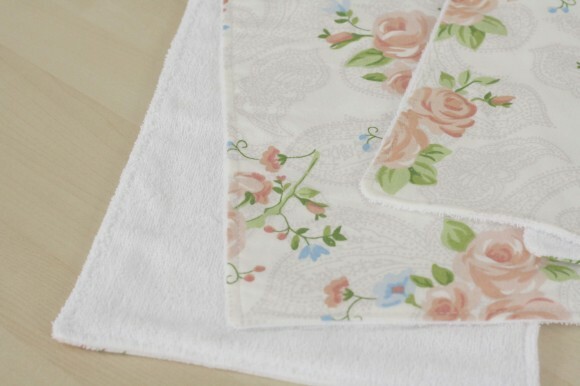 Gently lay flannel and terry right sides together on your cutting mat. Cutting both materials at the same time, use your rotary cutter to cut 3 12″ strips (they will be the width of your fabric, about 44″ long). 2. 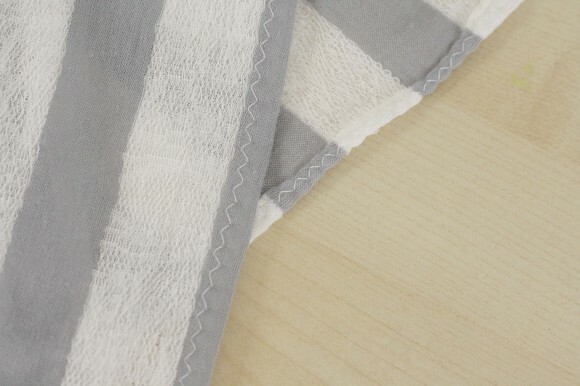 Sew a straight stitch around the entire perimeter leaving a 2″ gap open to turn. 3. Trim off the corners to help them lay flat once turned and turn right side out. 4. Iron each rectangle piece so the corners are nice and pointy and you are left with a clean edge (tuck in the edges of the open gap). 5. Use a straight stitch to top stitch around the entire perimeter. Voila! Burp cloths are finished! 1. 1.5 yards of three different jersey knits. 2. 1 yard of flannel. 3. 1 yard of terry cloth or towel material. Hope it all makes sense! Feel free to comment if you have any additional questions or are confused by my jibber jabber. I’ve truly enjoyed browsing your blog posts. After all I’ll be subscribing to your feed and I hope you write again soon! These are TOO cute! What a fab gift idea, I’ll certainly be using this idea! 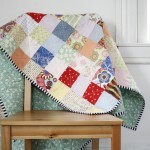 I love your fabrics …. where did you find them ? I got them all from JoAnn’s! These are completely adorable, I would love to have a go at making them! Love that r floral lace fabric, I’ve seen the flannel at joanns but for the life of me can’t find the knot or cotton online or in the store, you wouldn’t happen to have an item number would you? I don’t :/ Sorry! I think they can pull up the collection though from the flannel! Will the size you did for the headbands fit a newborn? After 2 wild boys were having a girl and I would love to whip up a few of these! Do you use 1.5 yards of jersey knit each color or 1.5 yards all together? So, 4.5 yards? or 1.5 yards? 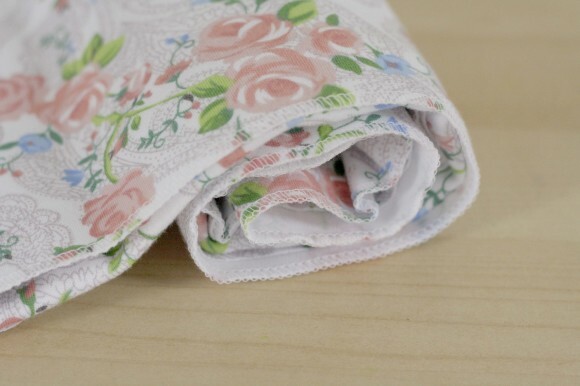 What was your tension setting for sewing the headband? i’m having issues with it bunching or stretching. Love this set – especially the headbands. Thanks for sharing! 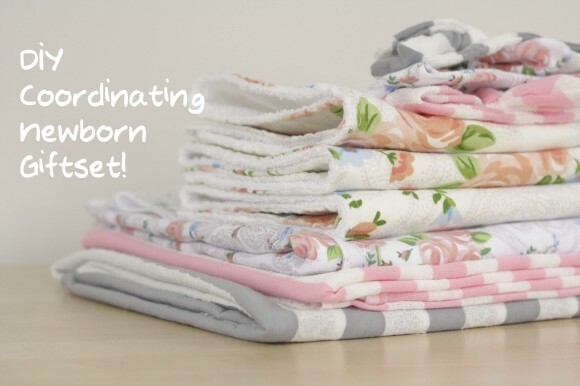 What a wonderful baby gift ideas. 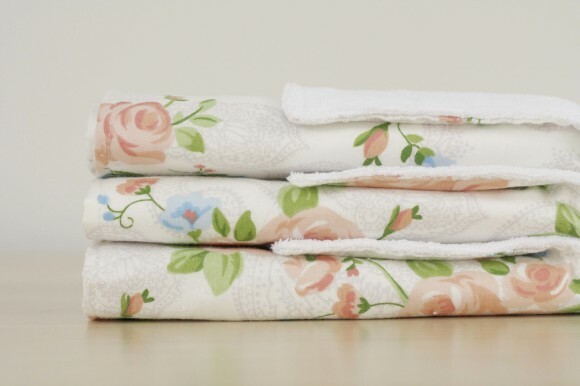 I’m hoping for grand babies one day, so I need to dust off my sewing machine. Thanks for sharing I will definitely be making some. Don’t have a serger (yet! ), so I will be using your tip about rolling and zigzagging the edges. Just to be clear about the direction they will roll…one side will roll to the “right” side of material and the next side will roll to the “wrong” side of the material, correct? Haven’t started the sets yet, but I have my material!!!! So nice!! Thank you so much for this tutorial! Super helpful and everything is so cute! You also do a very good job of explaining how to do this 🙂 I also like your model. Haha! 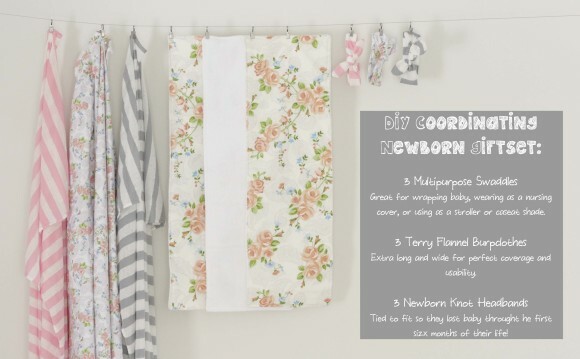 I do have one question: what type of flannel do you like to use for the burp cloths? I love these! I’m a beginner sewer and just attempted making my headband.. Problem is it just me or is it really hard keeping the jersey knit fabric straight while trying to sew? Mine kept slipping to the side so I kept pulling while sewing resulting in it bunching up. Maybe my fabric was too stretchy? I want the pattern for toddler headband. Hi Kim. There isn’t a pattern but if you follow the directions above and just lengthen the fabric you’ll have no trouble making one up yourself! Good luck! 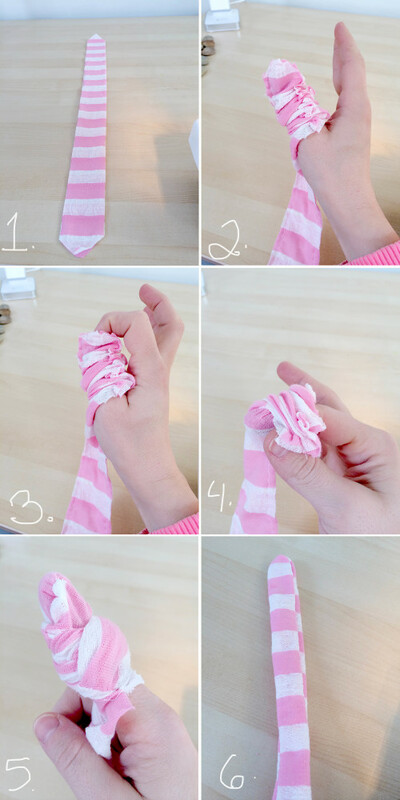 Very nice newborn knot headband. Thanks for sharing.